So where to Next for Corporate Governance on Social Media? Social networks are, after all and as I figured, extrapolated scaled models of our intrinsic human social permutations and permeations, perhaps even our psyche (doffing my hat to Freud and Jung). They even start from archetypes (Jung, again), they develop organically, and they form structures that reflect our ‘collective’ [Jung would have said ‘collective unconscious’, probably]. Bizarrely, that thin veneer of perceived protection from recourse for our actions afforded by thinking “well, its only a tweet” might even strip away some of the social airs and graces we might have in our fleshy lives, leaving a more immediate expression of our underlying thoughts, maybe, in some cases, perhaps. So, if you know a bit (well, a lot, frankly) about human sociological and psychological drives [see: homophily] you can predict what might happen next on any given social network. Better still, you can influence or even change what happens next on any given social network (it was Peter Drucker who told us “The best way to predict your future is to create it”). Now, you might need a little help over and above your gut feel to create your future on your chosen social network, and once you know what your future should look like, give Marc Smith a call (better still, tweet him, I did, and here we are). Marc and NodeXL can quickly and really efficiently (using virtual machines on the Amazon cloud) “do the math”. Actually, what Marc does is the sociology, he’s part of a multidisciplinary team, but using that collective intellect, they will help direct you to the next step in your pathway to success on the networks, and potentially, to success in achieving your strategic objectives. That’s if, and only if you’ve defined those objectives accurately, and really know what you want—we’re back to Peter Drucker—have you noticed how everything is circular and connected round here? Marc and I explored my favourite topic of Corporate Governance using the Twitter hashtag #CorpGov. The NodeXL engine dutifully went off and sucked about 10,000 tweets out of Twitter ‘via’ (now there’s a misused term if ever there was one) the Twitter API, and placed them neatly into columns in the Microsoft Excel 2007 spreadsheet. In moments, I could see a picture of my network stretching out in front of me like spaghetti junction on a good day, clear and green (you can change that). There was traffic, and I could see plenty of intersections, a few accidents, some happy coincidences, even one or two serendipitous moments. But above all else, what was clear was: those of us talking about Corporate Governance are a distributed yet cohesive set, with smaller, bridged groups coagulating around similar topics. We quote the same articles and URLs, we retweet each other. We’re what Marc calls a “Bazaar Network”, one most often seen with medium sized companies or political issues with various community involvements. He’s right, of course. That’s what we are, like-minded people talking about our values, norms, aspirations, musing about possibilities and tossing in the occasional flippant remark. So online life mimics ‘real life’ quite closely, not quite a carbon copy (yet), but I’d even say its pretty normal, really. 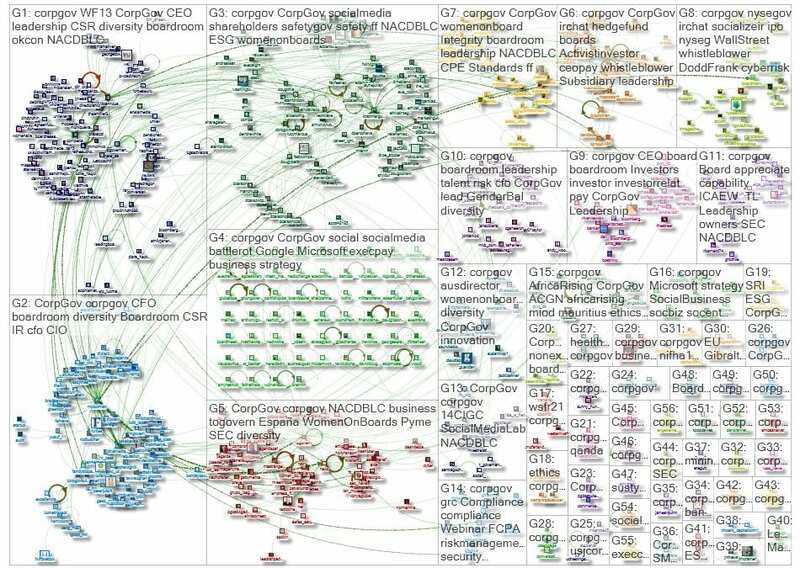 If you’re into this level of analysis, treat yourself to it here: CorpGov mapped on NodeXL Gallery, or dive into the navigable CorpGov network map, can you find yourself in there? I have to say that I knew all of that before I met Marc, but I knew it instinctively, and I’ve also used at least a dozen separate tools to confirm my own insights… but I’ll be giving up my addiction to Twitter analysis tools now. Marc, you’ve shown me the steps, and I’ve taken the first of them. Thanks Marc, that was time really well spent, and I am very grateful to you. The question this begs is: So where to next for corporate governance? We know what we’re all saying about it, and who we’re saying it to, and how many of us talk to each other about it, but what now? Comments are open, or tweet me on @ToGovern. 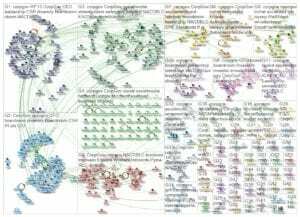 To explore another ‘edge’ (that’s when something joins you to somebody else in a database, in this case, the Marc / Mark connection), read Mark Fidelman, contributor at Forbes’ take on the same topic: Look out Klout, These Twitter Influencer Maps are Amazing.